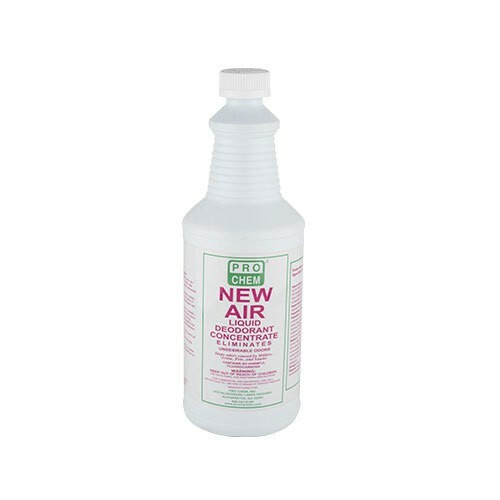 New Air | Pro Chem, Inc.
NEW AIR (floral fragrance) is a highly concentrated liquid deodorant. A drop or two is all that is needed to eliminate a variety of malodors and leave a refreshing aroma. Both of these deodorants are safe to use in air conditioner filters, commodes, cleaning solutions, pet beds, laundry rooms, automatic scrubbers, shampooing machines and in used cars to eliminate musty and beverage odors. When used as a space spray product needs to first be diluted with five parts water. A drop or two in commodes wash rooms disposals, garbage cans, pet beds, air conditioners, filters, litter boxes, and other enclosed areas, eliminates malodors and leaves a refreshing aroma.